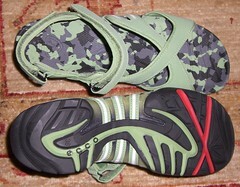 I picked up these little green dudes in a sale, as preparation for my upcoming HOLIDAY in CAIRO. They have the phrase ‘pat pending’ on the sole. Just like the wacky races character. I love that! The garish green is pretty darn cool too, for a wrinkly, if this is what boring old people wear, then so be it. * Past tips provided by Alan the hairdresser. Lucia the hairdresser, an anonymous manicurist, a Jackson’s sales assistant, a bus stop philanthropist, a mini salesman, Windows Network Diagnostics, Flat Eric and Reading Police. This scribble was published on Tuesday, November 10th, 2009. You can follow any banter on this scribble with the RSS 2.0 feed. You can share your inspired musings after typing the anti spam word near the bottom of the page. But no Pinging because its too naughty.